In the beginning, there was an idea: why not fuse completely different influences? OOMPH! follow this idea up to today, with the difference that the number of influences has increased steadily in proportion to their creative skills. Dero, Flux and Crap stand for new beginnings and continuity. For more than two decades, the trio has renewed, expanded and deepened their music repeatedly. Meanwhile, the constant process of innovation caused followers of completely different camps to become fans of the band based in Braunschweig today. In the beginning, a Berlin indie label distributed OOMPH!’s records. In 1998 the band switched to a Munich major label, landing first hits with “Das weiße Licht” (“The White Light”) and “Fieber” feat. Nina Hagen (“Fever”). A dream came true in the beginning of 2004, when the single “Augen Auf!” (“Open Eyes!”) reached No. 1 in Germany. The album “Wahrheit oder Pflicht” (“Truth or Dare”) went to No. 2 of the Media Control Charts and was decorated with a gold award, the single even received platinum. 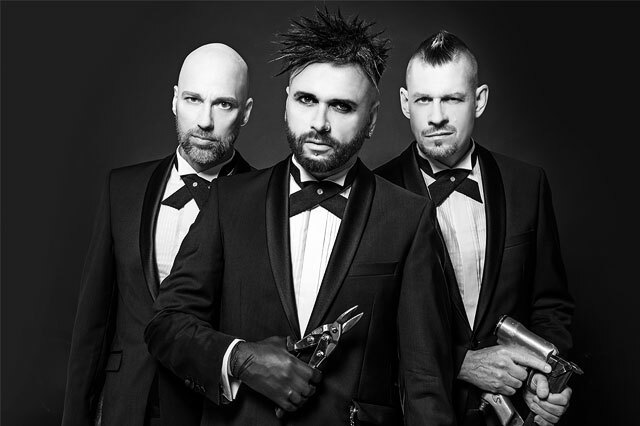 On top, the Lower Saxonians even obtained the respected radio award “1 Live Krone” as “Best Band of the Year”. Highlights were followed by setbacks. Like OOMPH! were excluded from the TV broadcast of the Echo 2006 and were not allowed to present their song “Gott ist ein Popstar” (“God is a Pop Star”). It was the time of the Mohammed caricatures – the TV producers lacked the courage to advocate the freedom of opinion and belief. In 2007, OOMPH! won the German TV music competition “Bundesvision Song Contest” with the single “Träumst Du” (“Are You Dreaming”) featuring the female singer Marta Jandová. Shortly after, the band participated in the German “Wok Championship” in Innsbruck, where singer Dero sustained a severe brain concussion as result of an accident. One year later good news returned, their album “Monster” (“Monster”) went Top 10. OOMPH! wrote the follow-up album “Truth Or Dare” (2010) completely in English. During their career, the Germans visited all parts of the world: the trio played concerts in Russia, the U.S. and nearly every European country. Musicians of numerous scenes and regions call OOMPH! their idols, amongst them Berlin’s Rammstein. With “Des Wahnsinns fette Beute” (“Completely Nuts”) the three marathon men round of the dozen, twelve albums in 23 years – only a few bands manage that. For the current opus, new rules were established. “Let’s allow ourselves everything, like we had just founded a new band. Let’s work self-ironically and not so serious. Before others laugh about us, we rather do it ourselves”, Dero phrases their intention. Additionally they had musicians that they were friends with come into the band-owned studio, who also threw in their ideas. “We wanted to re-discover ourselves. Away from gothic and melancholy, colorful instead of dark!”, affirms Crap. This way, the most diverse, most catchy, and funniest work of their career so far was created. Along the lines of “anything goes”, it became a motley selection of multiple styles, without losing sight of the roots of their beginnings. This way a guitar track like “Unzerstörbar” (“Unbreakable”) stands next to “Zwei Schritte vor” (“Two Steps Ahead”), a song with Sixties feeling and a horn section. “Such mich find mich” (“Look For Me Find Me”) is pure dance floor, “Bis der Spiegel zerbricht” (“Until the Mirror Breaks”) a yearning synth ballad. Accompanied by 80's pop like “Kosmonaut” (“Cosmonaut”), straight forward rock like “Komm zurück” (“Come back”) and a cabaret song with Reeperbahn flair like “Seemannsrose” (“Sailor’s Rose”). Musical wealth is combined with loads of witty humor in the lyrics. “Unzerstörbar”, for example, is about megalomania and self-delusion, things you often find in the music business after all. “Zwei Schritte vor” deals with the worldwide economic crisis and its wolves (banker), lambs (main street investors) and herding dogs (politicians). “Such mich find mich” revolves around love, while “Bis der Spiegel zerbrich” is about casting shows and disposable culture. “Aus meiner Haut” (“Out of my Skin”) deals with a favorite topic of singer Dero: “Every human being is bi, am-bi-valent and bi-polar. In my opinion, it shouldn’t be reserved for gays and bisexuals to write songs about homo- or bisexuality. Because I can act it out in lyrics and on stage, I am quite relaxed in that sense”, says the family man and father of two children. Flux sees the lyrics as “a metaphor for all the other areas, in which you might want to jump out of your skin, but don’t dare to do it. Maybe we should just put on a dress sometimes, take Marilyn Manson for example. He might like to make a cuddly album one day, but obviously can’t escape the tight-laced bodice of his own cliché.” With “Seemannsrose” OOMPH! stay on topic and even up the ante. In this sultry harbor honky-tonk track, almost every scene cliché is served. (Excerpt: “Komm mein schöner Leichtmatrose / lass uns bummeln gehen / lass herab die Seemanshose / alle soll´n uns fummeln sehen”, “Come on, my handsome sailor / let’s go for a stroll / let down your sailor’s pants / they all shall see us groping”).